Review 153. Jessica Day George – Sun & Moon, Ice & Snow. Title: Sun and Moon, Ice and Snow. -Princess 1: Princess of the midnight ball. -Princess 2: Princess of Glass. Blessed—or cursed—with an ability to understand animals, the Lass (as she’s known to her family) has always been an oddball. And when an isbjorn (polar bear) seeks her out, and promises that her family will become rich if only the Lass will accompany him to his castle, she doesn’t hesitate. But the bear is not what he seems, nor is his castle, which is made of ice and inhabited by a silent staff of servants. Only a gruelling journey on the backs of the four winds will reveal the truth: the bear is really a prince who’s been enchanted by a troll queen, and the Lass must come up with a way to free him before he’s forced to marry a troll princess. Finally! I’m starting to find the good retellings again. I loved her other series, so I was excited to give this one a try. I’ve never read anything about this fairytale before and I liked it. I'm definitely going to hunt down some more retellings and I hope to read the original story soon. The lass, also called ‘Pika’, never got a name. Her mother was mad that she gave birth to yet another daughter, because she can’t help to provide more money. When she saves a special reindeer, she is gifted with a name and the ability to understand animals. 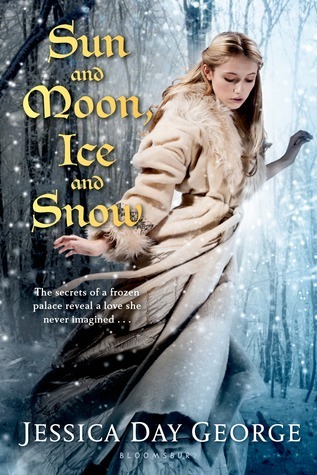 An enchanted isbjorn (polar bear) seeks her out and he offers her a deal: if she stays a whole year with him in his castle, he will make sure that her family will become rich. The lass accepts, but she isn’t planning to take everything for granted. She wants to find out more and that is how she starts to unravel his secret. When she accidently betrays him, her isbjorn is swept away to the troll princess whom he is forced to marry now. The lass decides to save him, but that isn’t going to be easy. The magical, enchanting feeling was the first thing that made me fall in love. Jessica has a great writing-style for this genre. The way she describes the setting is flawless. The lass grew up without a name, which is dangerous in a place where trolls come out to steal your kids. Her father is a loving man, the same for her brother Hans Peter. I didn’t like her mother; she is greedy and unsatisfied with everything. The lass has a great bond with her brother and I loved her loyalty towards him. While she is trying to save her isbjorn, she is also trying to make Hans happy again. What I liked the most about her are her flaws. She makes some understandable, stupid mistakes. It is in the human nature to be curious, but it was great that she is determined to make her mistakes right. The romance gets just enough time to be no insta-love. This book is the example of a story where everything feels right and Jessica proves again that she knows how to write. You should! They are a lot of fun. This sounds like a good read! I haven't read any of Jessica's books yet but this book seems so magical. I haven't read anything by Jessica Day yet but this sounds right up my alley! The magical and enchanting feel you described is just what I look for in fairytales :D Awesome review, thanks for sharing!! Ooh, I want an isbjorn! Reminds be of His Dark Materials. Anyways, I've never heard of this one before, but it does sound pretty great. So nice to hear you are finally enjoying your fairy tale retellings again! Yeah, I'm happy that I've found some good ones lately. This is on my list to read just haven't got a chance to read it yet ! Happy Reading All! I hope you're going to give it a shot soon. Yeah, this book is perfect for such a mood! I'm kind of intrigued by this one. I like it when characters are realistic; otherwise the book makes no sense. And if the romance actually takes time to develop, all the better! This sounds really cool-I'm not familiar with the original fairy tale but I'll want to check that out too so that I can compare them. I hope to find the original story soon. The princess series is also a lot of fun! YAY! I am so glad you liked this. It's my favorite Jessica Day George book, and one of my favorite retellings. And, yes, the setting and magical feel of this one is spot on. I wish I could read this one for the first time again. Ooh, that sounds like an interesting book. I think flaws really help build a character sometimes. It's great to hear that there is no insta-love, too! You know how I feel about that. ;) Fantastic review as always, Mel. I have heard this one is really good, need to check it out! I love her take on "The Twelve Dancing Princesses"
sounds interesting - I hadn't heard of this one. YAY! I've been wanting to read this one for awhile so I checked it out from the library for my upcoming vacation. Can't wait to dive in. I love JDG. Great review Mel!